We can define the Wigner-Seitz cell as the volume of space that is closer to a particular atom, than it is to any other atom in the crystal. The Wigner-Seitz cell for this crystal, is shaped like a truncated octahedron. 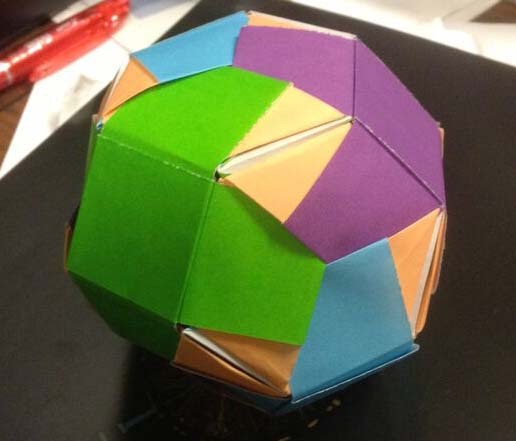 For technical reasons that I’m not going to bother explaining, my primary association with a truncated octahedron is not a Wigner-Seitz cell, but instead a Brillouin Zone. Curious readers are encouraged to become physics majors and study condensed matter physics. As far as the origami design goes, I’ve lost the design for this one! I made it back in the day when I didn’t think to document the folding steps. I could probably figure it out if I tried to reproduce it though. I believe it’s made from 56 pieces: 1 per hexagonal face, 2 per square face, and 1 per edge.